1 A None No Power Seat 1 A is an Economy Class Bulkhead seat. Proximity to the galley may be bothersome. The tray table is in the armrest, making the armrest immovable and slightly reducing the seat width. There is no floor storage during takeoff and landing. 1 C None No Power Seat 1 C is an Economy Class Bulkhead seat. Proximity to the galley may be bothersome. The tray table is in the armrest, making the armrest immovable and slightly reducing the seat width. There is no floor storage during takeoff and landing. 14 C None No Power Seat 14 C is an Economy Class seat that juts into the aisle and is often bumped by service carts and other passengers moving about the cabin during flight. 15 A None No Power Seat 15 A is an Economy Class seat. 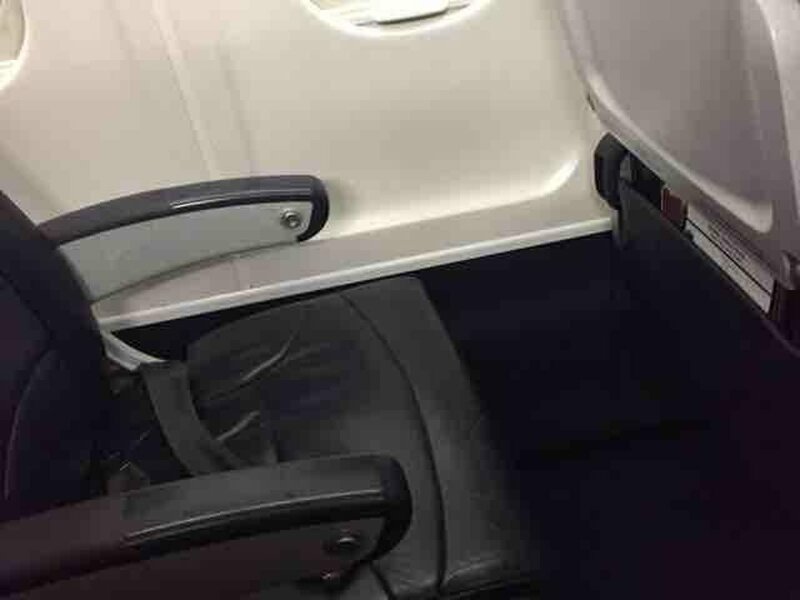 This seat is misaligned with the tray table in front of it due to the aircraft getting narrow from this section. Legroom may be restricted due to the misalignment of seats. 15 C None No Power Seat 15 C is an Economy Class seat. This seat is misaligned with the tray table in front of it due to the aircraft getting narrow from this section. Legroom may be restricted due to the misalignment of seats. 17 A None No Power Seat 17 A is an Economy Class seat which may have limited or no recline. Proximity to the lavatory and crew jump seats may be bothersome. 17 C None No Power Seat 17 C is an Economy Class seat which may have limited or no recline. Proximity to the lavatory and crew jump seats may be bothersome. 17 D None No Power Seat 17 D is an Economy Class seat which may have limited or no recline. Proximity to the lavatory and crew jump seats may be bothersome. 17 E None No Power Seat 17 E is an Economy Class seat which may have limited or no recline. Proximity to the lavatory and crew jump seats may be bothersome. 17 F None No Power Seat 17 F is an Economy Class seat which may have limited or no recline. Proximity to the lavatory and crew jump seats may be bothersome. 2 C None No Power Seat 2 C is a standard Economy Class seat, however, it may be bumped by other flyers. 2 D None No Power Seat 2 D is an Economy Class Exit Row seat which may have extra legroom legroom. Proximity to the galley may be bothersome. The tray table is in the armrest, making the armrest immovable and slightly reducing the seat width. There is no floor storage during takeoff and landing. 2 E None No Power Seat 2 E is an Economy Class Exit Row seat which may have extra legroom legroom. Proximity to the galley may be bothersome. The tray table is in the armrest, making the armrest immovable and slightly reducing the seat width. There is no floor storage during takeoff and landing. 2 F None No Power Seat 2 F is an Economy Class Exit Row seat which may have extra legroom legroom. Proximity to the galley may be bothersome. The tray table is in the armrest, making the armrest immovable and slightly reducing the seat width. There is no floor storage during takeoff and landing. 6 A None No Power Seat 6 A is an Economy Class seat that is missing a window. 6 F None No Power Seat 6 F is an Economy Class seat that is missing a window. CityJet's Avro RJ85 aircraft are used for regional air transportation for Air France. These aircraft are flown with 2 pilots and 2 cabin crew. CityJet launched its use of Avro RJ85 aircraft in 1992. The Honeywell LF 507 turbofan engines on these aircraft are designed to perform well on smaller and shorter runways. All seats on these aircraft are leather and the only class offered is Economy. CityJet’s RJ85 is equipped with the most technologically advanced flight deck and navigation systems. Somewhat spacious given the size of the aircraft. 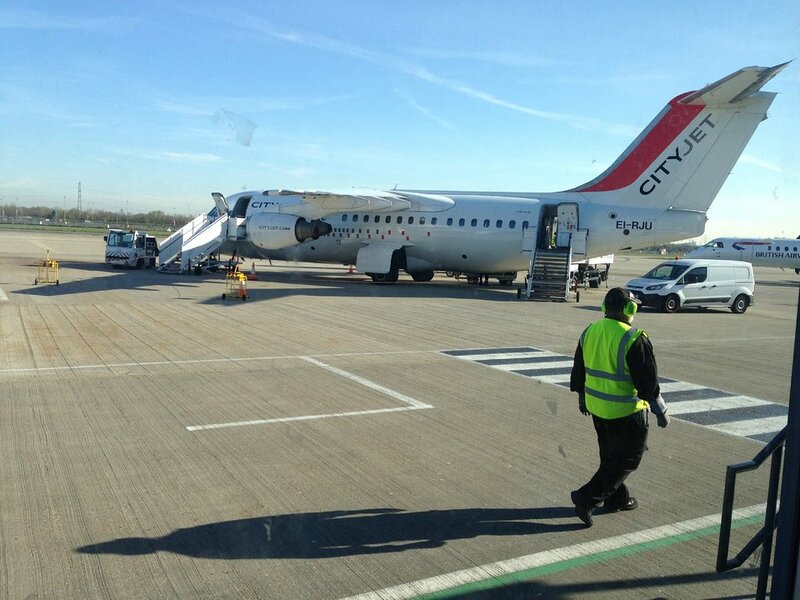 I had an Incredibly smooth journey on a Cityjet DUB-CDG flight. Interior seems brigher than most other jets. Incredibly cramped. Leg room is actually pretty OK but the aircraft is too narrow for 3+3 seating. No arm/shoulder room whatsoever. Always hot and very noisy. Very cramped cabin, seats are narrow, overhead luggage bins are small. A large passenger may feel uncomfortable. Crew were very professional. Wow talk about cramped, real tight fit. Uncomfortable is an understatement. The cabin crew however were very professional and did a nice job.. These seats have a smaller shoulder space than other due to aircaft mecanics. This is verry unconfortable. Bad Seat! It's the only one who has a basin, that means you cannot space your legs to right or left. This influences the Seat 15A also. The free trolley service will begin at the front of the plane. On flight such as LCY-DUB which are short, the crew will make it to the back of the plane just before landing, so if you want a drink & snack, go to rows 3 and 4. All of these seats are a mixed bag: the good part is that they are made of leather and are thickly padded with lots of leg room. The bad part is the bottom part of the seats, which is way too short. 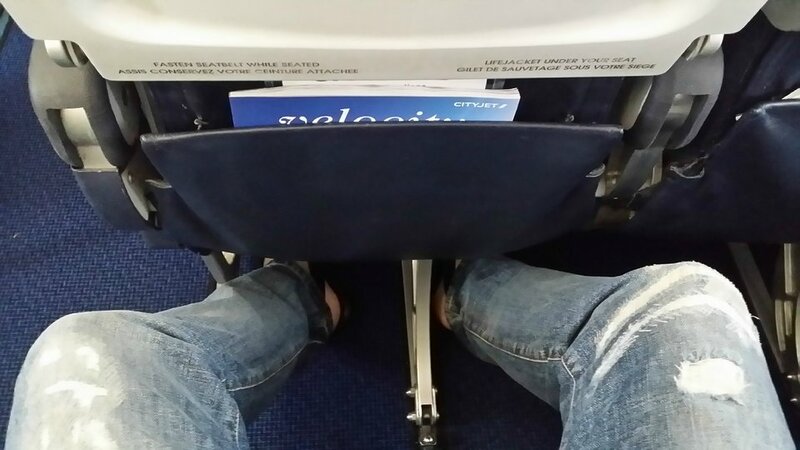 This makes your legs constantly cling over. Also the 3+3 layout is very cramped. Be aware that the row of seats under the wing part isnt the best place if you want a quiet ride, the noise from the engines is very audible. Seat 5F - the view from the window for this seat is mostly obscured by the engine. Watch out for Rows 6,7 & 8 as the bins above these rows are just half height due to the wings being above these rows - they won't fit a carry-on case. I had 13A outward which was fine though a bit noisy and view was obscured by engine - 14A would have had better view. I chose seat 4F on the way back and that was perfect. NB Row 3 might feel claustrophobic as they pull that silly curtain across to shield the premium passengers from 'the great unwashed'! Excellent leg room and comfortable leather seats. I was in seat 6A from Paris CDG to Newcastle. I have never had a worse seat, there is no window and there is a structural member intruding into the already extremely cramped space. This is the only flightI have ever felt claustrophobic. I would rather not fly than sit in this seat again. The armrests are closed off downwards. So if you have thick legs, this seat will cause some discomfort. Seats 2D, 2E, and 2F are the best. Nothing in front of you except bulkhead, and more roomthan 1A and 1B. 2A, 2B and 2C have seats in front of them, 2A might have a little more leg room. Arm rests are solid and fixed, making seats feel narrower than they already are. Service was efficient and pleasant. This is a very loud aircraft! All nice seats as they are all 2 seats instead of 3 in a row. Good leg room on the window side. 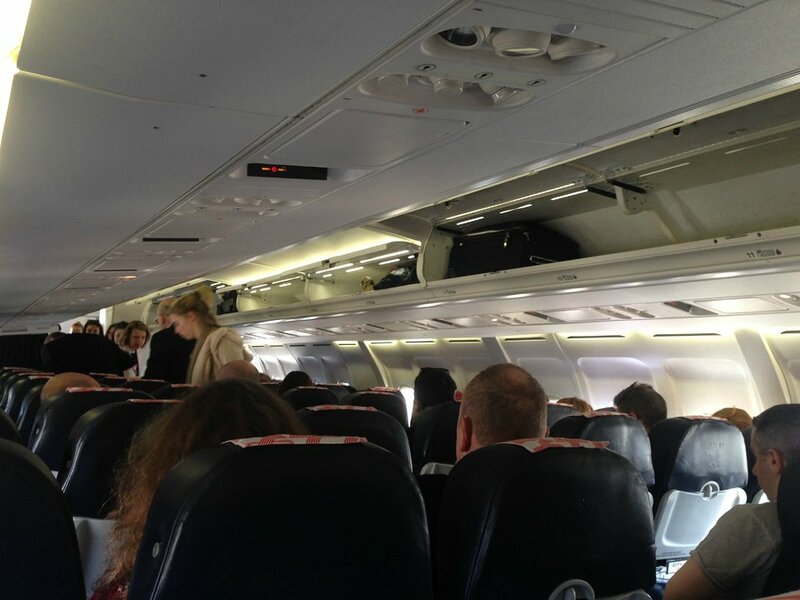 It is in the back of the plane, but flying to London City that doesn't matter as you can also off-board at the back of the plane. Leather seats are quite comfortable, from 11A you can sea the flap mechanism quite nicely. As the wing is overhead the luggage bins on these rows are half height and so can only fit a briefcase or coat - no roll-on cases. Lots of fighting for bin space around these rows! WX193 (City Jet) is codeshare Air France and KLM. 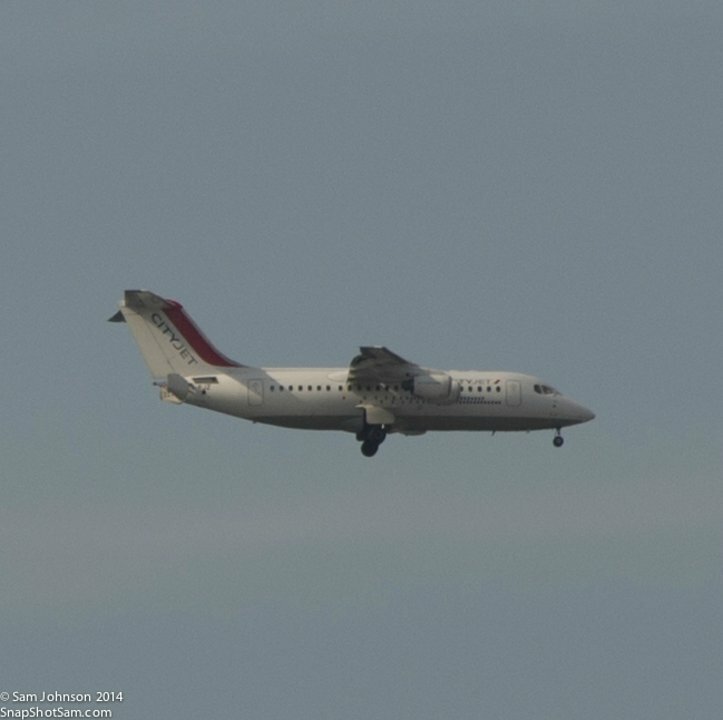 Air France flies 1 versions of Avro RJ85.